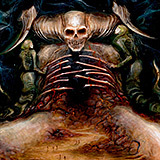 Often credited with the birth (or unholy spawning depending on your view) of the deathcore sub-genre of extreme metal, Maryland’s Dying Fetus have just released one of their most solid efforts in several releases. Combining the over-the-top technicality of 2007’s War of Attrition with the slamming brutal death metal that fans originally drooled over, these guys unleash a bestial slab of death metal in Reign Supreme. Sticking to their bludgeoning roots with this latest full-length, Dying Fetus don’t completely forget that they’ve been trending toward a more technical-based style of death metal, but they have figured out a way to balance the churning slam with precise sweeps and riffage in a full-on attack teetering on utter cerebral meltdown. Lead growler and guitarist John Gallagher (sole remaining founding member) let’s loose with some sick and twisted leads to accompany massive, slamming riffs throughout the album as bassist Sean Beasily keeps the rumble moving along nicely while latest member, Trey Williams (on drums) delivers a solid helping of pummeling rhythms and devastating blasts. “Invert the Idols” starts off with a little noodly doodly sweeping, but have no fear as it only lasts a moment (though it does appear again later) before rapid fire drums and full on riff destruction arrives with Gallagher’s gut wrenching vocals and a crazy down-tuned bit of slam just before the two minute mark. The opening track does a solid job of setting the tone for the remaining eight songs as evident by “Subjected to a Beating” and its more developed riff work and mid-pace churning march across your skull  that’s peppered with grinding blasts of frenzied mayhem and a sick solo just before the four minute point. This is certainly one of the more memorable albums this band has put out. It’s varied rhythms, technical guitar work, slamming mayhem and musicianship is some of the best the band has ever put out. The first two songs were only setting you up for the one-two attack of the overtly technical and blasting “Second Skin” and the absolutely crushing “From Womb to Waste.” Both of these songs showcase the band at their extremes  one highlighted by Gallagher’s impressive guitar work and the other dominated by bowel emptying rhythms and groove. “Dissidence” unleashes an all-out barrage of grinding drums and driving guitars while “In the Trenches” sticks with the groove for the most part and “Devout Atrocity” bring back the technical guitar work for another round, as well as some absolutely malevolent slam. “Revisionist Past” is a bit of a departure for the band. Sure it’s got plenty of pile-driving drums and nasty riffs, but it’s also got a good deal more melody injected violently into the mix which separates it from the rest of the album. Closing track “The Blood of Power” wraps up the album perfectly, utilizing all of the band’s tricks (technical, groove and slam) to fully encapsulate what this album was all about. Reign Supreme is without a doubt one of the more enjoyable albums I’ve heard this year and could very well be a turning point for a band that has stagnated some over the last few years. 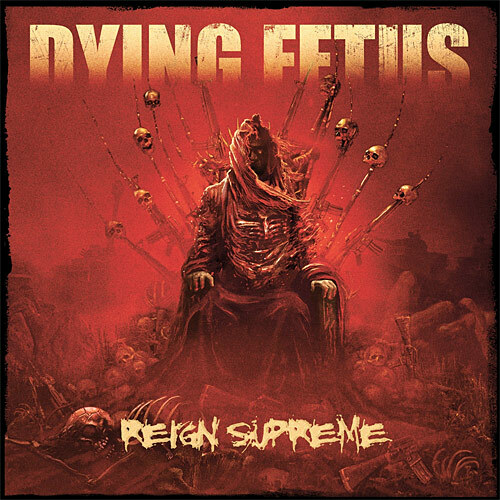 Whether you’ve been a fan of Dying Fetus since their inception or not, this is an album that has to be heard regardless of where your allegiances lie.